Hand split some mesquite i have and planed them into cutting boards for some friends. They are large and left natural. Will put some oil on them and then they are done. Consider making end grain cutting boards with what you have. It seems a shame to use such nice wood on a face grain cutting board. 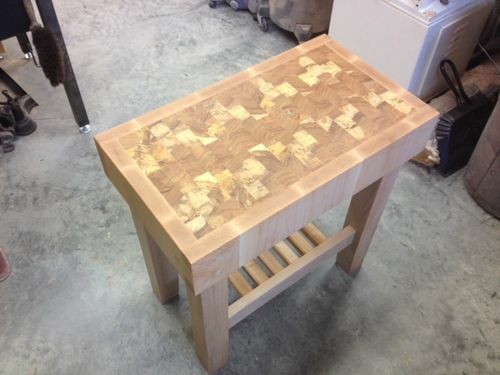 I used a hickory slab and made this cutting board table for a client. A face grain cutting board would not have the character I achieved through the planning of how the pieces would look after the second glue-up. There are plenty of how-to videos on UTube which will teach you in short order. Here’s the top of the hickory table, which spalted in the log before it was sawn into 8/4 slabs. The light shapes are from sapwood. I took into account how much sapwood there was before I made my first glue-up. Thanks Dale, I thought about the end grain option but everyone wanted long grain slabs. I think they want more display than use. I have a small pile of decent size mesquite so I am going to cut some and hand split them into usable boards then try the end grain. I will post pics when I get started.